Collages are a great way to show multiple perspectives and arrange video clips on a canvas, but most online design tools don’t support video. If you want to be able to place videos side by side, arrange them around each other, overlap layers, add captions, and overlay images, you’ll need a Collage Maker with the power to support video, GIFs, and images. On social media, collages – images, GIFs, and video clips arranged around each other – attract attention, stick out from other content, and get more likes/followers. Instagram and Tumblr personalities make memes, add shapes and text, and arrange their videos and images in cool original layouts to showcase their media. In this post, I’ll explain how to make video collages online with Kapwing. Kapwing is a free collage web app with simple tools for arranging media, text, and layers on a blank canvas. In my opinion, Kapwing’s Collage Maker is the best app for making video collages on any device. Kapwing is free to use and online, so you don’t need to download software to use it. You don’t even need to make an account to use Kapwing – just head to the website and get going. When you open Kapwing’s Collage Maker, you can either pick a collage template or click “Get Started” to make a custom collage. The canvas defaults to a square 1:1, but you can use the “Resize” button in the toolbar to change the shape of your video collage for other social media platforms: 9:16 for Instagram and SnapChat Stories, 16:9 for YouTube, 4:5 and 5:4 for Facebook, Twitter, Tumblr and LinkedIn. 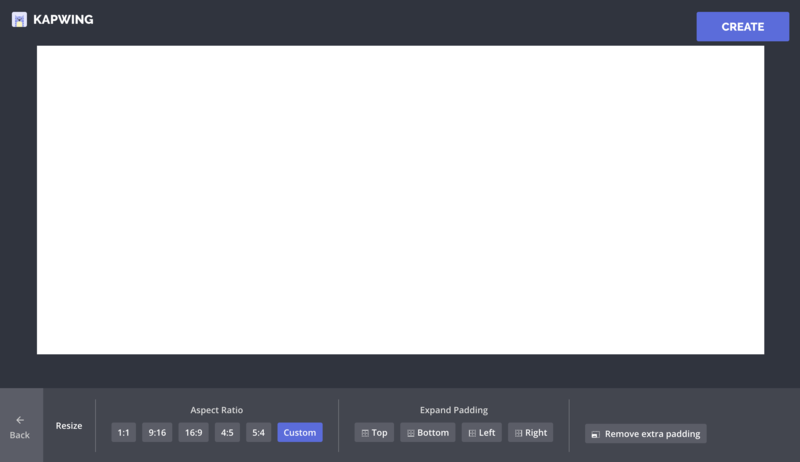 You can also make the canvas bigger or smaller by using the “Add padding” buttons in the Resize toolbar. These controls enable a very wide or narrow canvas for your video collage. Use the “Upload” button to add your images and videos. Kapwing supports images, GIFs, and videos (as long as the file is smaller than 300 MB). You can upload directly from your phone or computer, or you can import from a YouTube, Vimeo, Google Images, or Giphy URL. You can add and resize as many images and videos as you want on the canvas. By default, Kapwing plays all of the audio in the clips. If you want some of your videos to play without sound, you can use the “Mute” tool to remove audio from a clip. Drag and drop the layers to arrange them. You can use the “Bring forward” and “Send back” buttons to position them above and below each other, change the color of the background, trim video clips, add text and rectangular shapes. Kapwing supports custom colors and has a huge library of fonts. Everything can be resized and snapped to the center of the canvas. When your collage preview matches what you want the collage to look like, click “DONE” to process your video collage. You can share the Kapwing URL with your friends, or you can download the video as an MP4 and publish it on social media. If you make a mistake, you can always click the “EDIT” button to tweak the collage layout. You can also reuse your video collage and replace the media with something new. Hopefully, this intuitive tool will bring out your creativity and collage vision. Happy collaging! 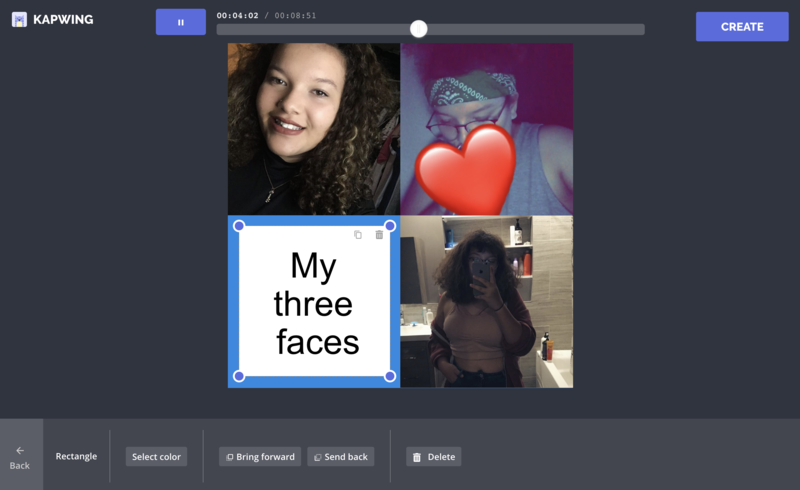 We made this collage tool to empower creators and make GIFs, photos, and video file types compatible with each other.